Showtime Spectacular opened in rousing style with There’s No Business Like Show Business from Annie Get Your Gun. Helen Pearce (soprano) continued the scene setting with the title song from Cabaret. The choir then sang a selection from Calamity Jane (Secret Love sung by soprano, Rebecca Joisce) and The King and I. Another solo followed with Abby Evans (alto) singing Tell Me On A Sunday from Song and Dance. Then it was back to the choir for two songs from Carousel – June Is Bustin’ Out All Over and You’ll Never Walk Alone. A duet, Falling In Love With Love, from The Boys from Syracuse by Edward Dann (baritone) and Hugh Hercus (tenor) followed. The theme of love continued with the choir singing Can You Feel The Love Tonight from The Lion King. Love was also in the air when the choir sang a selection from Les Misérables, with solos by Abby Evans, Helen Pearce, Rebecca Joisce, Frances Brightman (alto) and Terry Pearce (bass). The first half ended with George Russell (bass) and Edward Dann singing Sunrise Sunset from Fiddler on the Roof and the choir singing a selection of songs from Show Boat. The second half opened in style with a group of the choir’s ladies performing Big Spender from Sweet Charity, complete with red and black feather boas that shed feathers all over the floor! Then it was the turn of the men to come forward to sing the Gendarmes’ song from Geneviève de Brabant. 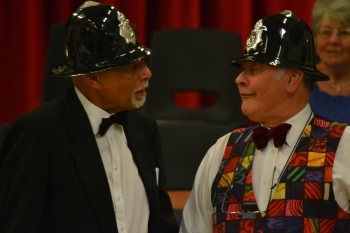 They continued to wear their policemen’s helmets to accompany Terry Pearce as he sang the Policeman’s song from the Pirates of Penzance. The choir’s first song of the second half was Oklahoma from Oklahoma. A quartet of Helen Pearce, Rebecca Joisce, Abby Evans and Frances Brightman then sang All That Jazz from Chicago and Someone Like You by singer-songwriter Adele. The choir returned to sing Any Dream Will Do from Joseph and the Amazing Technicolor Dreamcoat, a selection from South Pacific and A Grand Night For Singing from State Fair. Don’t Cry For Me Argentina from Evita was then sung by a trio of Rebecca Joisce, Helen Bell (soprano) and Frances Brightman. This was followed by Helen Pearce singing What I Did For Love from A Chorus Line. The concert ended with the choir singing first a selection from West Side Story and then one from Oliver. This concert of sacred music on Palm Sunday began with with choir singing Agnus Dei by Bizet. John Buckley (tenor) then sang Dvorak’s setting of The Lord Is My Shepherd and the Victorian religious ballad, The Holy City. This was followed by Helen Pearce (soprano) singing How Beautiful Are They Feet from Handel’s Messiah, the choir performing And No Bird Sang by Douglas Wagner, and Leslie MacLeod-Miller (baritone) singing Lord God of Abraham from Mendelssohn’s Elijah and Caccini’s Ave Maria. The Easter hymn, When I Survey The Wondrous Cross, and Howard Goodall’s setting of The Lord Is My Shepherd were then sung by the choir. The concert ended with the main piece of the evening – a performance of Strainer’s Crucifixion by the choir with soloists John Buckley (tenor) and Leslie MacLeod-Miller (baritone). Members of the choral society joined the church choir for the annual Festival of Nine Lessons and Carols. 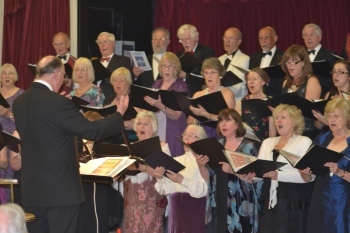 The choir opened the concert with a rousing rendition of the popular Christmas hymn, Joy To The World followed by the traditional song, Christmas Is Coming, and an arrangement of In The Bleak Mid-Winter by Ringtail. After the first three carols for the audience to join in, Rebecca Joisce (soprano) sang an unaccompanied Wassail, with words originally from Somerset but adapted for Steven ton The choir returned to sing the Old German carol, The Linden Tree, and a new a cappella arrangement this year by Olla Gel of Away In A Manger (soprano soloists: Helen Bell and Rebecca Joisce). Then it was back to traditional carols, Deck The Hall, and A Little Child, by the choir before a duet by two contraltos, Abby Evans and Frances Brightman, singing an arrangement of the well-known Leonard Cohen song, Hallelujah, first released in 1984. A further carol for the audience and the another traditional carol, See Amid The Winter Snow, in the setting by John E. West ended the first half. A group of ladies from the choir, plus one gentleman for the vital role of Santa, set the second half of the concert off in style with a medley of popular Christmas songs including Cliff Richard’s Christmas Alphabet (with suitable props and costumes) and Santa Got Stuck Up The Chimney. After some humorous anecdotes from John Hunt and a song from Terry Pearce accompanying himself on his guitar, in complete contrast the choir sang Candlelight Carol – the first of three pieces by John Rutter in this half of the concert. This was followed by a new arrangement of Walking In The Air by Howard Blake and a solo by Helen Pearce (soprano) of the song, Count Your Blessings, by Joseph Locke. Three more audience carols were next followed by another Rutter piece, Angel’s Carol, an arrangement of God From On High by the choral society’s pianist, Michael Evans, and a setting of Ave Maria by Giulio Caccini sung by the choir. 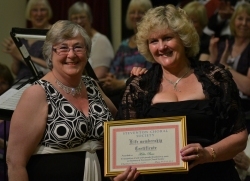 Two of the evening’s soloists, Helen Pearce and Rebecca Joisce, then combined to sing the Christian contemporary song, You Raise Me Up, with music by Rolf Løvland and lyrics by Brendan Graham. Colours Of Christmas, the final Rutter piece from the choir, preceded the final audience carol and the concert ended with the choir looking forward to the New Year with Ring Out Wild Bells by Percy Fletcher.